The 20-year-old forward is participating in his third summer league. Will the Suns look to move the third year Croatian? Even though the Phoenix Suns have played just two games in the Las Vegas Summer League, there is one big concern that the Suns should be looking at. That would be the play of one Dragan Bender. The third year big man has struggled mightily against the Summer League competition. In two games, Bender has scored just five points in 46 minutes of play, contributing eight rebounds and three blocks. The biggest stat that must be trouble for the franchise is turnovers. Bender committed five turnovers against the Dallas Mavericks and four against the Sacramento Kings. With one more game Monday evening, this could be the last chance for the forward/center to make a good impression. Coming into the offseason, Bender looked to be in a battle with Marquese Chriss for quality minutes. Is it too early to give up? Since drafting Bender with the fourth overall pick in the 2016 NBA Draft, Bender has flashed a couple of times throughout his two year career, but that's about it. 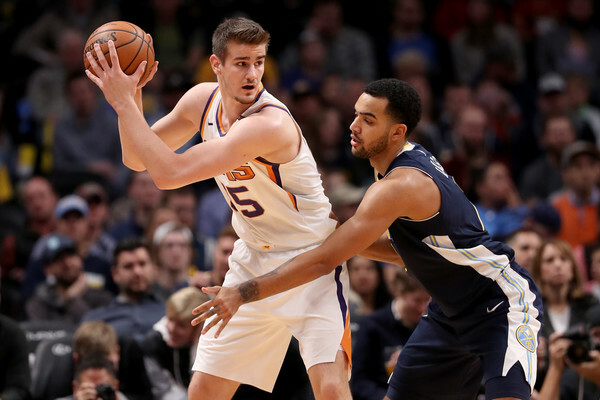 In two seasons, Bender is averaging just 5.4 points, 3.7 rebounds, 1.2 assists and .6 blocks per game, leaving more to be desired by the Suns. In 125 games, Bender has accumulated 677 career points, 464 total rebounds and 144 turnovers. 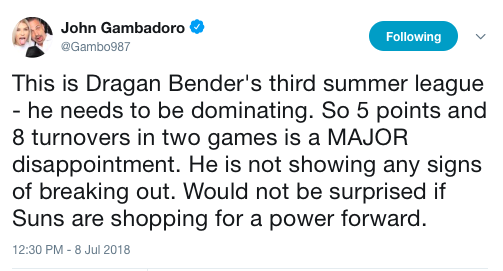 With that being said, that raises the question should Phoenix look to trade Bender before his junior season? With point guard still unsettled, the Suns could look to trade Bender for a decent point guard. There are teams out there that could use the services of Bender. Maybe a fresh start elsewhere is what the young big man needs.